The WEMPE BREMEN Series has always been one of the most popular instrumentation series of the traditional German manufacturer. After more than twenty years we recently introduced the new edition of this product line. The BREMEN II Series includes a battery-powered ship clock with quartz movement that is also available with tide indexes, a barometer, and a comfortmeter. The enclosure either consists of colourlessly lacquered and polished brass or a chrome plated surface. Further particularly exclusive instruments are a bell clock and a radio room clock that has red and green radio sectors. The glass edges was altered in a manner that all marine instruments of the WEMPE BREMEN II Series can be opened from the front side. The switching of batteries and readjustments are thus easy tasks. 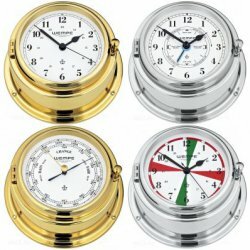 The ship clock and the 8-day glass clock are available with Roman and Arabian numerals printed on white clock faces - like all other instruments of this product series with clock diameters of 100mm.